Since 1975 Oakley has been creating innovative eyewear worn by world-class athletes. Reinventing the concept of eyewear was only the first step. Oakley’s desire to invent and evolve ‘stuff’ for the sports they love has led them to develop a range of apparel and accessories designed for an active lifestyle. In 2010 Oakley will introduce their first Oakley Active Collection. Inspired by their female athletes, the women’s active eyewear and apparel has been designed with a clean, uncomplicated style and with the innovation and craftsmanship the world has come to trust from Oakley. The design is unique and very attractive to look at. For me the comfort is extremley important and the compulsive SQ has 100% comfort, very soft and the fitting is perfect. 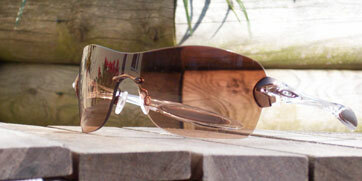 The brown tint on the lenses is very effective, I don't squint or need darker lenses to keep the sun off. The last two weeks I have used the glasses nearly everyday in Devon where the sun has been fantastic. For anybody wishing to purchase a pair of sunglasses from oakley for everyday use I would definitley recommend the Compulsive SQ.